October 12th is a very special day. It’s the day Jon’s dad, Sigmund, was born. Anniversaries and birthdays can be challenging times to “get through” when you’re missing someone you love who has passed on. I used to completely dread the death anniversaries of those I’ve lost until the passage of years taught me that those anniversaries paled in significance to the memories of the celebrations and other events that mark a person’s life. Most people feel special on their birthday, and I think it’s important to continue to honor one’s entrance into this world even when they’re no longer here to blow out the candles on their cake. In that spirit, I made reservations at The Coach House for a birthday dinner in honor of Jon’s dad. I spoke with one of the owners, and she kindly arranged for a special dessert for the occasion. I only told Jon that we were going out to dinner that evening – he had no idea where until we pulled up to the restaurant. I can honestly say the menu at The Coach House is perfect, and I absolutely loved what I ordered. It is arguably the finest restaurant in OKC. But,….even though this is a restaurant review blog, and we obviously focus on the food, atmosphere, service, etc.,….I’m not going to get into those details right now. Jon and I will be going back (he promised me at least once a quarter!) and together we will do a more thorough review later on. For now, my feelings about our dinner at The Coach House are centered on the warmth that radiates from Jon when he talks about his dad and the way his eyes light up when he recounts family memories. And mostly on the gentle mannerisms, incredible thoughtfulness and steadfastness that I admire so much and imagine Jon may have inherited from his dad. I’m so grateful to have Jon in my life, and thankful as well that he had such an extraordinary father who helped guide him into the amazing man that he is. 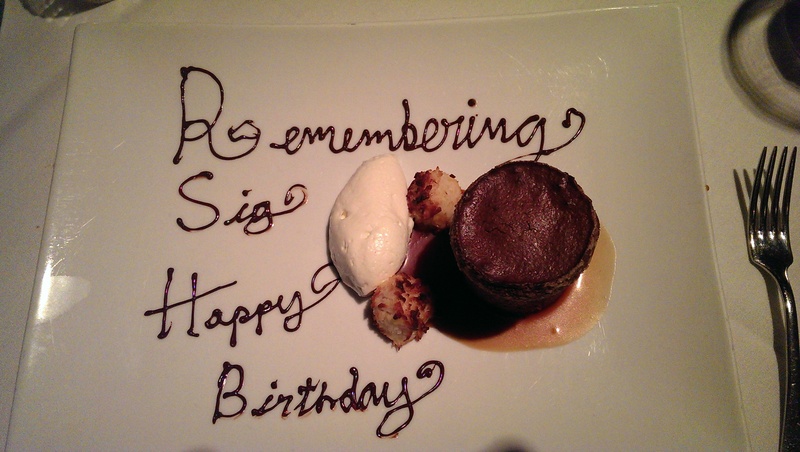 I’m hoping for many more future opportunities to celebrate and learn more about Sig’s life.